» Hashtags on Pinterest – Hacks you need to try! In September 2017 Pinterest announced that they were turning on functionality for hashtags. You could always add hashtags to your posts on Pinterest however they weren’t clickable until now. All of a sudden they flipped a switch and you can click and search hashtags on Pinterest with incredible results. It used to take months to get momentum behind your content in Pinterest’s SmartFeed. Today I’m going to share with you a couple tips on how to experiment with hashtags on Pinterest as well as some best practices to help you grow your Pinterest traffic in a matter of days. How many hashtags can you use on a Pin? You can use up to 20 hashtags on a Pinterest post. Think of hashtags as another opportunity to get even more keywords onto your post. Just make sure the hashtags are relevant to the content in the post. You don’t want to fall into the trap of looking like a spammer because you’re using every hashtag under the sun. Additionally, even though you can use 20 hashtags on your posts, you only have 500 characters total to work with in the description for each pin. We recommend that you use about 350 words for your keyword-rich pin description and the other 150 characters for 3-5 keyword focused hashtags on each post. What happens when you use hashtags on Pinterest? When Pinterest first made the announcement about hashtags, I heard lots of grumbling from the social media and blogging community. Some people thought it would go away and others simply ignored hashtags. But I saw a HUGE opportunity! We started using hashtags on brand new pins on brand new posts on one of our sites. 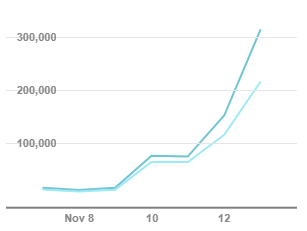 Within 2 days, posts that had been published in the last week saw a HUGE spike in traffic, as you can see from the graph above. We cross-referenced this graph from Pinterest Analytics with our Google Analytics account for this site and saw a direct correlation in traffic growth. For the last two years, about 5 posts dominated the top 10 referral spots on that site as far as traffic. After implementing hashtags, the first 15 traffic referral spots in Google Analytics were dominated by pins from two seasonal blog posts we published in the last week. In a matter of days, we were able to increase traffic on posts that were less than 7 days old by using hashtags on our pins on Pinterest! One of the keys to understanding how hashtags work on Pinterest is to use Pinterest like a user. Us marketers tend to think like marketers … and it’s super easy to spend all of our time on scheduling tools like Tailwind without ever actually visiting Pinterest. It’s such early days with hashtags on Pinterest that it’s a good idea to check in on both mobile and desktop at least once a week to see what changes are happening on the platform and to see what kind of experience users are having when looking for content. I’ve experimented with doing some searches on Pinterest for hashtags. When you search for a particular term, like “candy corn”, the results that you get are kind of a mixed bag. You’ll get some posts about candy corn and then you’ll get all these other posts about blogging and instant pot recipes and just all kinds of weird things that are not what you’re looking for. However, if you search for “#candycorn” you will get really really focused search results. For example with #candycorn the whole page of search results is going to be orange, yellow, and white because you’re going to get so many great candy corn results. One of the reasons for this is that the posts on Pinterest that are already using hashtags are images that people added from Instagram, which have hashtags in the caption. You can use tools like Tailwind to pin your Instagram posts and it will pick up all the hashtags that were in the caption on the original Instagram post. But there’s also something in the algorithm that makes it easier for Pinterest to pick out that keyword content that’s related to the hashtag when you search for a hashtag versus a keyword alone. So what does this mean for you? Well it means that you have a better chance of showing up in search for the regular keyword term such as “candy corn” and for “#candycorn” if you are using the hashtag. That means more people are going to see and find your content. Another hack is to look at the suggested hashtags that show up when you type a hashtag in the search bar on Pinterest. Just like Pinterest gives you keyword combinations that have been searched on the platform when you type anything into the search bar, Pinterest will also give you hashtag combinations based on the hashtag that you’ve typed into the search bar. This means that Pinterest is another place that you can do hashtag research really easily. So instead of just putting “#candycorn” into my post, I’m going to put that plus all of the suggested hashtags that show up when I’m searching #candycorn. Basically Pinterest has done the research for you. And is one final hack has to do with your blog name. Have you ever wondered what Pinterest thinks your blog is all about? Type in #yourblogname into the search bar and see what comes up! Look at your results and analyze them to figure out what Pinterest thinks your site is all about. Want a step-by-step guide to using hashtags to get more traffic from Pinterest? If you want more clever hashtag tips for all the platforms then join the waitlist for Hashtag PRO, the course I developed to teach you how to become a hashtag pro. Literally! I’ve only just started testing out using hashtags on some pins and this was super helpful. Thank you so much. I just tried this on desktop and I’m not getting the autofill results from Pinterest search. Is this just a Pinterest glitch? Pinterest is glitching a lot right now — that usually mean they are making changes. I’d check again in a few days. 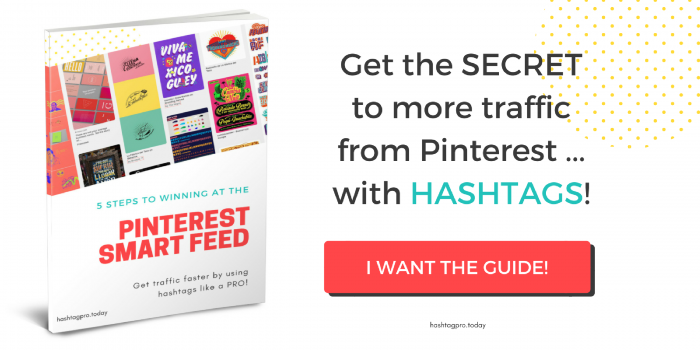 I want to get MORE traffic FASTER with Pinterest TODAY! SUBSCRIBE to our newsletter and get the BONUS 5 Steps Guide with your first email! Your Privacy is protected. By subscribing, you will receive email newsletters from Smart Creative Social.